[pdf document, Eric J. Chatfield, Ph.D. and John R. Kominsky, M.Sc., CIH, CSP, CHMM, October 12, 2001] At the request of a informal committee of elected officials including U.S. Congressman Jerrold Nadler and Manhattan Borough President Virginia Fields, two environmental scientists, Eric J. Chatfield and John R. Kominsky took indoor dust and air samples near the WTC site in September, 2001. They found high levels of asbestos in many of the samples, and recommended that all WTC dust be treated as asbestos-contaminated unless tested and shown to be asbestos-free. 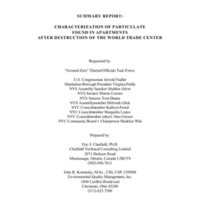 “Summary Report: Characterization of Particulate Found in Apartments After Destruction of the World T,” September 11 Digital Archive, accessed April 19, 2019, http://911digitalarchive.org/items/show/2888.